Last week Bristol mayor Marvin Rees said: “I want Bristol’s skyline to grow. Years of low level buildings and a reluctance to build up in an already congested city is a policy I am keen to change. Tall buildings built in the right way, in the right places and for the right reasons, communicate ambition and energy.” Back in the 1960s the same thought occurred to national and local politicians. Building tall was the way to solve the chronic housing crisis. The Government added a premium to housing grants for tall blocks of flats. The programme left a legacy of poor quality tall buildings in Bristol, often unloved by their occupants, which dominated their neighbours. Some local authorities have pulled down their high rises; buildings where nobody wanted to live. In 2005, the Council adopted its Tall Buildings Policy Advice, nationally recognised as an example of best practice. The Policy followed a large-scale public debate about tall buildings that successfully used an interactive website. 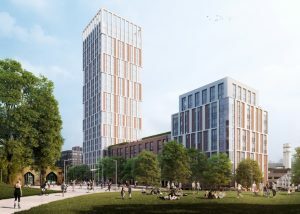 The consultation found that tall buildings from the 60s and 70s were unpopular and people wanted Bristol’s skyline to be rid of them. There was support for new tall buildings if they are well designed and located to ‘fit’ into the existing urban landscape. One thing is very clear: schemes for tall buildings prove to be controversial, polarising views on their relative merits. To reduce speculative applications for tall buildings in the wrong places, the advice maps out those areas in the city centre where they may be acceptable. The city centre and Broadmead, Old Market and Temple may be most appropriate; they are well served by public transport. The best planning practice is to cluster tall buildings together and not pepper them across a city. To be accepted, a tall building in other parts of the city must show exceptional qualities. It is of utmost importance that the location of a new tall building should not harm the character of an area for the existing residents. Bristol Civic Society supports the mayor’s policy to promote high density residential schemes to meet the acute housing shortage and to avoid urban sprawl. Tall buildings are not essential; they are only one of several ways to increase building densities. In several respects high rise buildings are less sustainable than high or low rise buildings: the inflexibility of space and difficulties of change of use have been a problem. Other high density building types can be better and more popular; the Junction 3 scheme, shown in the above photo is an excellent example.